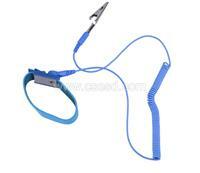 The material of PVC anti-static wrist strap is soft and elastic material added with the conductive wire. Product Information: The material of PVC anti-static wrist strap is soft and elastic material added with the conductive wire. The conductivity of the anti-static wrist strap is pretty good, and the length is adjustable. The spring ground lead can endure 30000 times experiments, and the length is 180cm. Loop: Adjustable rubber; Material: elastic nylon yarn and metal complex conductive crape. Strap Resistance: Less than or equal to 103Ω; Grounding resistance: 106Ω; Electrostatic leakage: Less than 0.1s. Helix: PVC scarf-skin, inside is the 4 cores tinsel wire, the resistance is 1 ohm, it is nickel-plated hasp and elastic manganin plug.